Product information "Glucose Uptake Cell-Based Assay Kit"
Glucose metabolism is a primary source of energy and biomaterials for the maintenance of cell homeostasis. Extra glucose is stored in the muscles and liver as glycogen which is hydrolyzed to glucose and released into the blood when needed. The rate of glucose uptake in cells is dynamic and tightly regulated by hormones and/or growth factors including insulin. Cancer cells exhibit increased glucose uptake and metabolism by aerobic glycolysis in order to support a high rate of proliferation. Chemicals that block glucose uptake by cancer cells have been shown to have anti-cancer effects. Cayman's Glucose Uptake Cell-based Assay Kit provides a convenient tool for studying modulators of cellular glucose uptake. The kit employs 2-NBDG, a fluorescently-labeled deoxyglucose analog, as a probe for the detection of glucose taken up by cultured cells. Apigenin, a flavonoid that has been reported to be an inhibitor of glucose transport, is included as a control. 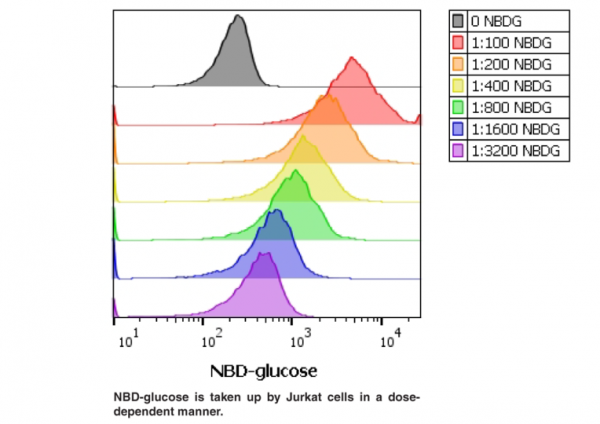 Customer review for "Glucose Uptake Cell-Based Assay Kit"